At Visakhapatnam nearly 13 years ago – India batting first opened with Sachin Tendulkar and Virender Sehwag. Against Pak, with Rana bowling, Indian score at 26, Sachin was out for 2 and Sourav Ganguly hatched a master plan of promoting a man who had scored 0 in his first outing; 12 & 7* (against Bangladesh) and 3 against Pak at Kochi – the rest is history as the man scored 148 hitting Pakis to all parts of the ground – India totalled 356 and won by 58 runs. It is indeed thala Dhoni. Mahendra Singh Dhoni has since retired from Tests & T20 – but continues to play ODI. In 90 tests he has scored 4876 (256 catches and 38 stumpings); in T20 has 1444 runs ~ and in 318 ODIs has 9967 runs – 10 tons – average of 51.37; strike rate of 88.40 besides 297 catches, 107 stumpings and over 200 sixers ~ a true champion adored by millions of Cricket followers in India. 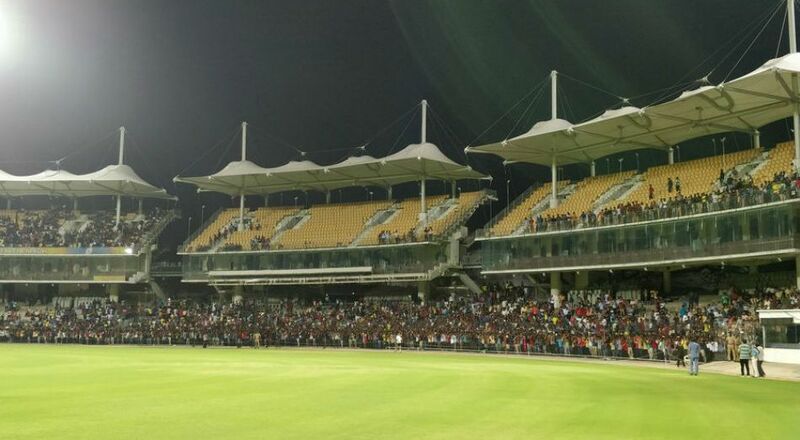 In India, Cricket is a religion – while the game may not attract so many - over 10,000 spectators watched Chennai Super Kings play an intra-squad practice match at the MA Chidambaram Stadium on Sunday, and Rajiv Kumar, the newly-appointed fielding coach of the Lions, was amazed at the fan support for the much-decorated franchise. He is new fielding coach who has earlier captained MSD and so well known to him. CSK is back and soon the city will be painted yellow and will be whistling for the local team. CSK won the IPL title twice, finished runners-up on four occasions and qualified to the Playoffs in all eight seasons between 2008 and 2015 to emerge as one of the most successful sides in the competition. The Lions will take on defending champions Mumbai Indians in the opening game of the 2018 season at the Wankhede Stadium on April 7. CSK founded in 2008 has been in wilderness for 2 years and for the parched fans, this IPL should be a great season as they come back after a two-year suspension for the alleged involvement of their owners in the 2013 Indian Premier League betting case. MSD’s batting position has been a debatable point in India's limited-overs set up in the recent past. Since Champions Trophy last year, Dhoni has featured only once at No. 4 in 19 innings in 50-overs cricket and has been more of a floater at No. 6 and No. 7. In the last few T20s, too, he has been walking in at No. 6. However, the Chennai Super Kings skipper is set to have a promotion in the batting order come the IPL. CSK head coach Stephen Fleming said that Dhoni will bat "relatively high" without revealing much about the slot at which the he is expected to bat. Padma Bhushan is the third-highest civilian award in the Republic of India, preceded by the Bharat Ratna and the Padma Vibhushan and followed by the Padma Shri. Instituted on 2 January 1954, the award is given for "distinguished service of a high order... The award criteria include "service in any field including service rendered by Government servants" including doctors and scientists, but exclude those working with the public sector undertakings. MSD is the proud recipient of Padma Bushan and he received it in style. MSD came to the ceremony in his Lieutenant Colonel uniform, walked like an army personnel when his name was called upon to receive the award. The Indian Territorial Army had conferred the honorary rank of Lieutenant Colonel to Dhoni on November 1, 2011, months after India won their second World Cup under his leadership. Incidentally, Dhoni is receiving the prestigious award exactly seven years since lifting the ICC Cricket World Cup as India skipper in Mumbai on April 2, 2011. On this day seven years ago, India ended a 28-year World Cup drought by winning their second title in front of a manic home crowd at the Wankhede Stadium. Style, thy name – MSD and we fans adore you.